The independent web developers of this 2.0 world have done a great job in making federal legislative information available in new ways; see GovTrack.us and OpenCongress.org for examples. The same is happening with federal regulatory information. New, free, nongovernment resources have come online to complement the official U.S. government regulatory information sites, RegInfo.gov and Regulations.gov. For this bounty, we can thank innovative developers and the relatively new availability of a free XML version of the Federal Register that can be downloaded in bulk. The Federal Register has long been available for searching and viewing for free, but subscribing to the data in bulk–necessary for meaningful repurposing–carried a cost that discouraged entrepreneurial individuals. In the meantime, both RegInfo.gov and Regulations.gov have been redesigned and continue to provide content and functionality not available on the other free sites mentioned in this article. The government’s top-level regulatory website is RegInfo.gov, managed by the General Services Administration (GSA), Regulatory Information Services Center (RISC), and the Office of Management and Budget (OMB) Office of Information and Regulatory Affairs (OIRA). 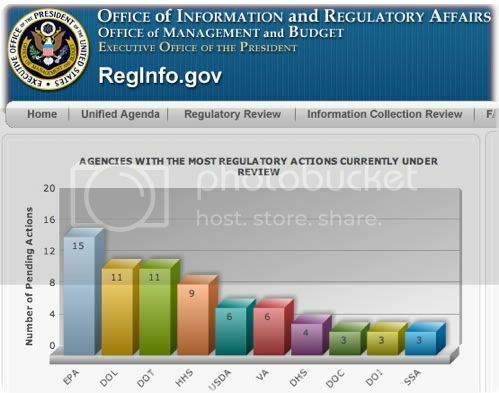 RegInfo.gov tracks the steps in agency and OMB regulatory review that happen outside of the Federal Register publication process, usually before a proposed regulation or final rule is published. This information can help you see what is coming down the review process pipeline or let you know that a draft proposal is stalled in that pipeline. Unfortunately, RegInfo.gov does not offer RSS feeds or other current awareness services. For guidance, the site features RegMap, a helpful chart of basic notice-and-comment rulemaking procedure. RegMap and RegInfo.gov’s essential FAQ page help researchers understand what they can expect to find and how it fits into the broader process. The content on RegInfo.gov is unique. Its purpose differs from the other sites discussed here, which focus on providing current awareness or interactive comment features for items published in the Federal Register. I reviewed Regulations.gov in an earlier column, The Government Domain: Regulations.gov 2.0. The site has been redesigned since, but the essentials remain the same. Regulations.gov is the central, official location for public comment on proposed rules published in the Federal Register once they have passed any necessary OMB review. Regulations.gov also displays the docket folder for the regulation when an agency supplies it, content not available on the other sites described here. The docket can include material referenced in the regulation, adding to your understanding of it. Regulations.gov’s most prominent 2.0 feature is the ability to comment online and review the comments of others. The site has its own guide to the comment feature. (The nongovernmental site Regulatory Resource Center from OMB Watch provides detailed guidance as well.) Regulations.gov also highlights which regulations and which agencies’ regulations have generated the most comments. The site has RSS feeds of new Federal Register items by issuing agency. Items are indexed by topic, but there are no RSS feeds for topics. Regulations.gov claims to have the participation of “nearly 300 agencies”; the full list is linked from the site’s About Us page. Despite the broad coverage, you may benefit from also visiting the regulations section of an agency site, provided you know which agency has issued the notice or regulation of concern. The Environmental Protection Agency, for example, has launched a new Rulemaking Gateway portal of its own. The EPA site focuses on its priority rulemaking. You may find priority proposals here before they appear on Regulations.gov. Regulations.gov is still the official channel for filing comments, and the EPA site links to Regulations.gov for this purpose. OpenRegs.com, one of the first free online alternatives for tracking federal regulations, offers RSS feeds of proposed rules with comment periods ending soon; recently opened comment periods; recently published final regulations; and recently published “significant” regulations. (Significant regulations are those reviewed by OIRA because they have a significant economic, budgetary, legal, or interagency impact; for details, see the RegInfo.gov FAQs.) OpenRegs.com also has feeds for proposed and final rules by agency or topic. The search feature is a basic keyword search across all data fields. Be sure to use double quotes to indicate an exact phrase. According to OpenReg.com’s About page, “OpenRegs.com should serve as the launching pad, research portal, and discussion community for your regulatory adventures.” Like other nongovernment sites described here, OpenRegs.com can help you locate an item, but you’ll need to go to Regulations.gov to comment on it officially. OpenRegs.com makes this easy with a link from your item to the same item on Regulations.gov. You can also tweet individual items. The site’s discussion community, called Forums, is organized by agency; so far, it is a very sleepy community. The OpenRegs.com project is led by Jerry Brito of the Mercatus Center at George Mason University. The site now offers an iPhone app; check it out at openregs.com/iphone. FedThread.org was launched after the Federal Register became available for free, bulk download. Princeton University’s Center for Information Policy runs the site. It provides an alternative interface to the Federal Register from 2000 to the present and lets you turn any of your Federal Register searches into an RSS feed or email update service. The site has an advanced search; to use it, click Search on the home page and choose the advanced option from there. Advanced search lets you limit a word search by: publication date range; agency name; type of item (proposed rule, final rule, notice, or presidential document); action (“reopening of comment period,” for example); and part of the Code of Federal Regulations affected. This all sounds grand, but at times search can be remarkably slow and quirky. Paging through search results can also be slow. Since results are provided in chronological order, starting with items from 2000, you will want to take advantage of the publication date limit in the advanced search to hone in on recent items. Aside from the ability to build RSS feeds and email alerts—which admittedly is a fantastic feature—I have found the Federal Register search on FDsys.gov to be faster and just as easy and powerful. FedThread.org’s most 2.0 aspect is its hosting of comments and discussions. As with OpenRegs.com, the comments do not go to the issuing agency; instead, they are meant to provide an opportunity for discussion among interested parties. While OpenRegs.com hosts comments in its separate Forums section, FedThread.org lets you comment directly on the item and link comments to a specific provision. You can also get an RSS feed or email alert for subsequent comments made on the item. As with the OpenRegs.com forum feature, the FedThread.org comment feature has been only lightly used to date. Justia.com, an essential free law research site, is beta-testing Regulations Tracker. Justia’s regulations site is more like FedThread.org than OpenRegs.com; the emphasis is on searching the Federal Register rather than alerting you to proposed regulations open for comment. You can search the Federal Register from 2005 to present by word and limit search results by issuing agency, item type, and date range. The search results are displayed in a way that a serious researcher can appreciate, with the Federal Register page range and document number upfront and the date sort showing most current items first. You can browse by agency and create an RSS feed from that display. As with FedThread.org, search seems to be a work in progress: my searches did not turn up known items from 2010. It appears that the 2010 text had been added but not yet indexed. This is a beta, so you may wish to verify search results on FDsys.gov. The Cornell e-Rulemaking Initiative (CeRI) recently launched the Regulation Room website as a pilot project to test the online environment for public input in rulemaking. The pilot is using a proposed Transportation Department regulation on texting while driving as its first test case. The proposed rule is Limiting the Use of Wireless Communication Devices, 75 Fed. Reg. 16391 (April 1, 2010). The Regulation Room texting comment page walks participants through a structured dialog, concluding with a summary of comments. CeRI will submit the summary to the Transportation Department as a formal public comment. Individual comments to Regulation Room are not transmitted to the agency as formal comments, although the agency can access them. From the site’s FAQ: “Regulations.gov is the official web portal for submitting comments on all proposed federal rules. The official notice (Notice of Proposed Rulemaking) of every rule available on Regulation Room contains a link to the Regulations.gov comment submission form for the rule.” Transportation is collaborating with CeRI on this experiment, as announced in the agency’s March 31 press release. As more government information becomes available for free download in bulk, we can look forward to testing and using more alternative sites for research and engagement. All of the sites discussed here are relatively new, even in Internet years. Expect to see more evolution in free legal and government research tools over the years to come.